A few years ago I must have had really too much free time, so I engaged in the toy project of writing an emulator for the Galaga arcade machine. By emulation I don’t mean writing a game “just like” Galaga (which would not be a trivial task, anyway) but really emulating the hardware of that old arcade machine in all its details: the original ISA we want to emulate is those of the old Z80 processor and the program we want to run is the one stored in the original ROMs. Of course I knew that MAME and MESS already existed, and I snooped through its sources to find out how that machine actually worked. My initial goal was to have something running on a browser, so not tied to the Windows platform, and to learn something about software emulation and virtual machines in the process. For this reason I chose to use first Silverlight as host, a platform that looked very promising at the time. After that I quickly ported the code from C# to C++ (even to see what the speed-up could be) and made it run as a WinRT app, more recently converted into a UWP app for Windows 10. But let’s start from the beginning: how did an arcade machine from the 80s work? And how difficult is it to emulate it? Interestingly, Galaga was multi-core. There were three Z80 8-bit processors, which shared the same address space and RAM, but executed each a different program, stored in a set of different ROMs. Other ROMs contained the graphics (sprites and a tiles) and the audio waveforms used to generate sound effects. There was a form of inter-processor communication based on interrupts: Z80 handles maskable interrupts by executing an interrupt handler located at a fixed address in the ROM. In Galaga the interrupt handler managed a vector of commands with a jump table, so the main CPU could invoke a procedure on one of the other processors simply by setting the index of a command in a location in shared memory and signaling an interrupt. Beside the main CPUs there were a number of custom chips, dedicated to different functions. There was one just to handle the graphics effects of the star-field in the background, others were used to to render the graphics, to manage the input controls and to produce the sound effects. To play Galaga we need to emulate the workings of all its components. All the pieces must be connected as they were in their circuit board; and for this we need to find detailed information about the original schematics. Luckily, besides MAME, there are a numbers of sources for this info in the Internet. Galaga’s popularity meant that there has been a great deal of low-level hacking over the years. For example, someone entirely disassembled the 24K bytes of Z80 code from its ROMs (1, 2, 3) to the point of being able to find the root cause and fix the famous bug that made the alien bees stop firing after a while. Another electronics wizard wrote the code to emulate the sound hardware on a PIC. I wrote the machine emulator engine in C++, making sure that it compiled with the latest versions of Visual Studio and Clang, so that it could be used to drive different hosts, possibly running on different platforms. The first thing I needed was a software emulator for the Z80 microprocessor. The emulator, of course, should run in real time, so it is important that the emulation of the Z80 instruction set should be performed very efficiently. The original machine had three Z80 processors running at ~3MHz, so we need to make sure that the time spent to emulate these chips is just a fraction of the machine nominal execution time. In other words, we want to emulate 10 msec of machine time in less than 10 msec). There are two main techniques for emulating an instruction set (see Smith, Nair “Virtual Machines”). The most efficient one is binary translation, which converts whole blocks of a source program into a customized binary program in the target ISA. A much simpler technique is the “decode-and-dispatch interpreter”, which works by fetching one instruction at the time, analyzing and executing it and modifying the source state. In our case more than 20 years have passed since the days of 8-bit processors, so we can afford to choose the simplest technique and write an interpreter for Z80. Even so, this turns out to be the most computationally expensive part of the emulator, so it’s important to optimize carefully this code. Besides the Z80, a couple of the custom chips in the machine are also based on another very simple 4-bit microprocessor, which also needs to be emulated, and even here we can use a simple “decode-and-dispatch interpreter”. We have seen that the memory space is partially shared by the three main processors, so when an address is accessed by the CPU, it may refer to a portion of the same RAM or it may refer to one of the ROMs, which are instead separated per processor, with different ROMs mapped into the same range of addresses for different processors. This is not the whole story: some of the other chips are also memory-mapped, so the CPU instructions used to access the memory can also be used for accessing these devices; the emulator needs to take care of all this, managing the mapping of addresses into the right device. Other devices use instead port-mapped I/O and are accessed via a dedicated set of microprocessor instructions, (in and out in Z80) on a separate, dedicated address space. Our emulator, of course, must also take care of this port-mapping. The graphics system was similar to those of the 8-bit microcomputers of the time (like the Commodore 64). The screen (of 224 x 288 pixels) was managed as a tilemap of 8×8 characters, and the graphics system also supported up to 64 sprites that were rendered above the tilemap. First, the star field in the background is drawn. In the original, there is a custom chip to move and draw the stars; its behavior needs to be replicated. Then the matrix of 28 x 36 square tiles (224 x 288 pixels) is drawn over the star field, by reading from video-memory the index of the tile to draw and the color to use. Tiles are used for all the text that appears in the game, like the score; the content of each tile (a bitmapped font) is read from a ROM. Finally it draws up to 64 sprites over the tiles. Even here, size and position and colors of each sprite is stored in a mapped area of video memory, while the sprite bitmaps are read from separate ROMs. Audio synthesis turned out to be by far the most complicated part of this project. In Galaga the audio system is composed by two different chips that generated two audio signals. The first chip is a 3-voice waveform sounds generator. It uses a library of waveforms, read from a PROM, to generate digital samples for sound effects and little tunes. The second chip, a sound/noise generator based on a 4-bits controller, was only used to generate explosions. This is a discrete sound circuit, made with analog components, like operational amplifiers and DAC. The emulation of a discrete circuit was the part where I really had to dig into the MAME sources to be able to move on. A final mixer merges these two audio streams and generates a sequence of samples in the format of a single PCM channel of 16 bit samples at a sample rate of 48 KHz. A nice thing about the emulation of a game machine is that, once the engine is written and works, it can easily be “hosted” in different apps. We can see the arcade emulator as a black box which takes a number of inputs (the state of the button controls, coin insertion) and, when run for some time interval (quantum) of N microseconds, produces a set of outputs: the video frame that results from the execution of the machine and the set of audio samples that were generated in that interval. To guarantee smooth video rendering and low-latency audio we need to keep the time interval very small. For example, a quantum of 16.7 msec would allow a frame rate of 60 frames/second and a reasonable low latency for the sound. Note that the code of the engine is totally platform-independent; once we have defined the format for audio samples and video frames, until we just change the state of the input controls and run quanta of emulation time, we are not really doing anything that interacts with the host, yet. So, we can reuse the same emulator experimenting with different “host applications”, comparing the technologies and measuring their performances. We saw that the engine produces screen frames, in the form of arrays of pixels, and audio samples, in the form of arrays of PCM samples; the challenge will be to find the most efficient way to render these frames and to play these samples. Let’s start with a classic Windows app. In this case Direct2D is probably the best choice to quickly redraw screen frames. Personally I am a big fan of Direct2D and of its simple, low-level interfaces. (In one of my projects at work recurring to pure Direct2D for the most complex part of our user interface unexpectedly turned out to be a much simpler and faster solution than relying on a more declarative XAML-like framework… but this is another story :-)). There are very efficient ways to render video frames with Direct2D, like swap chain buffers, but in our case we don’t need anything so sophisticated; it is sufficient to use a single bitmap to represent the game screen. ID2D1Bitmap provides a method CopyFromMemory to fill the bitmap from an array of pixels in memory, and this is all we need. We’ll see later how to deal with the audio samples. What is missing now is audio rendering. We can use the same technology both in a classic Win32 app and in WinRT/UWP. XAudio2, the replacement for DirectSound, which provides a very simple API for low-level access to the soundcard and it is particularly suitable for videogames. XAudio2 works by building an audio processing graph and in our case the graph will be very simple: there is a source node (voice) that produces the emulator- synthesized samples (in the form of a single 16 bit PCM channel at 48 KHz) and there is a mastering voice that represents the audio device. Here _voiceContext is a pointer to an object that implements the IXAudio2VoiceCallback interface, used to buffer and synchronize the samples to be played. Our emulator produces a continuous sequence of samples which we need to play in real time, with minimum delay and without glitches and the best way to do this is to use a circular buffer (see Petzold). 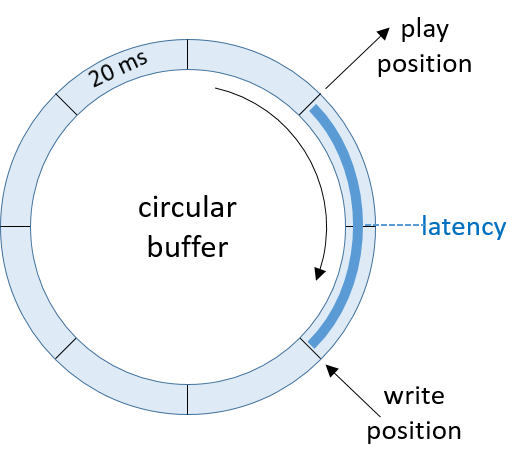 More precisely, we use an array of small buffers arranged in a circular queue so that when one of the buffers is being played, the other buffers can be filled and queued to be processed. Every time we run the emulator for a quantum of time (GalagaMachine.Run(…)) we get the set of samples that the machine would have generated in that time interval and we insert them into the queue. For simplicity, we can ask the emulator to provide us samples in small buffers with the same size of the buffers in the queue. Having a little buffering is useful to compensate for moments when the computer’s CPU is too busy to keep up with the task of producing audio samples in our emulator. The bigger the size of the buffers, the more resistant the app will be to transient changes in CPU load that could starve or overflow the queue. But we pay this buffering with latency, a delay between the moment something happens in the game and the moment the sound effect for that event is played; a bit like the delay between lightning and thunder. On a normal Windows PC we can generally afford to use relatively small buffers; I found that using a queue with three or four 20-msec buffers (each with 48000 samples/sec * 1 channel * .02 sec = 960 samples) works very well in most cases. More sophisticated algorithms could be used to dynamically adapt the latency to the CPU load. So far, everything was quite easy: writing an arcade emulator for Windows is not a particularly difficult task. With native code we can efficiently emulate another ISA and the system provides us with a simple API to quickly render video frames and to play audio samples. The real problem is that the resulting code is not portable. If we want to support a different platform we can recompile and reuse the C++ code for the emulator, but we need to rewrite all the “host” code that deals with audio and with screen frames. We can see that the resulting code is really the equivalent of assembly code, only written in JS rather than in a native binary. (The optimized version would be less verbose but also less readable). Asm.js was designed (by Mozilla) exactly for the purpose of being used as a target language for the source-to-source compilation from a statically-typed languages like C/C++. You can find more details in the spec, but in a few words, asm.js is JS without all the potentially slow parts (like dynamic type guards and garbage collection); it only supports the parts that can be executed very efficiently (strictly-typed integers, floats, arithmetic, function calls, and heap accesses). The static-type rules allow much faster JIT compilation or ahead-of-time compilation, the script engine can perform optimizations that would not otherwise be possible, and the generated code can be surprisingly fast, running at near-native speed! It is difficult to write Asm.js code by hand (exactly as it is to code in x86 assembly). It is difficult to port programs that have a lot of interactions with the OS, or that do a lot of I/O, or that use many external native libraries. There is no support for multi-threading. If you are curious, you can use the Octane benchmark to measure the performance of your browser. There is also an interesting demo that shows very effectively what difference running on a browser optimized for asm.js can make. At this page, two chess engines are matched against one another. They are both compiled from the same Stockfish source code, but in only one has a flag set to tell the browser that the code should be interpreted (and optimized) as Asm.js. Of course this is the engine that wins all the matches as long as the game is played on a browser that supports asm.js. This chart, taken from http://caniuse.com/#feat=asmjs, describes the current status of the browser support matrix. Currently Asm.js is fully supported by Firefox and Edge, while Chrome is still a little behind. In fact, while it’s unlikely that Asm.js will ever be used for traditional web-development (DOM/CSS), it seems perfect for a particular application like a software emulator (and already in 2011 Fabrice Bellard used Emscripten to write an impressive emulator of a Linux PC). The code of the emulator engine already builds with Clang, it is “self-contained” (with no external dependencies a part from the CRT and the STL), it does not use multithreading and exposes a very simple interface to its clients. So, it does not require any adjustment: once it’s compiled with Emscripten the resulting asm.js code can be used right away in the browser. The only question left to be settled now is: will asm.js be fast enough to run a (relatively) computationally intensive application like an arcade emulator in real time? In order to find out, we first need to install the Emscripten SDK (the latest version can be found here). This is an API intended to simplify animations: we call requestAnimationFrame and pass a callback that the browser will call before the next repaint. The callback routine must itself call requestAnimationFrame() to animate another frame at the next repaint, and so on forever. The repaint rate is usually 60 times per second, but the browser may reduce it to a lower rate when the page or tab is in background or when we are in a hidden , in order to improve performance and battery life. In step(), the call to galaga.Run() is where we finally go to Emscripten-compiled code and run the emulator for a quantum of execution time. The duration of this interval will vary according to the variable refresh rate, and to calculate it we use the timestamp that is passed as argument to our callback. // ... runs the emulator for a timeslice, obtains videoFrame, audioFrame. At initialization time, we create an ImageData object with the same size of the arcade screen. A small complication is that we need to scale the ImageData to fill the whole canvas, which is resized to fill the whole browser window. The best way to do this is to draw the imageData into another off-screen canvas and then draw the off-screen canvas to the original canvas. Finally, the last thing left to do is to play the audio sample synthesized by our emulator. This is probably the most complicated part of the whole project; one could argue that today with HTML5 WebAudio there is no really good way to do this. 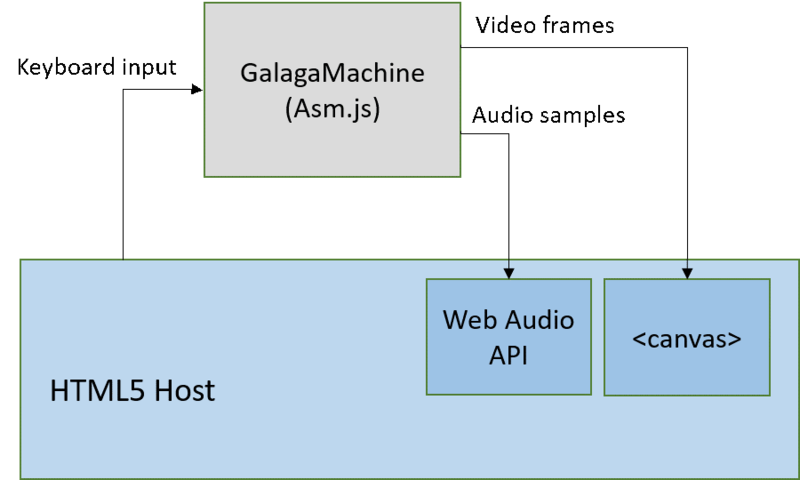 WebAudio provides a rich API to capture, manipulate and play audio samples. Audio operations are performed by putting together a graph of audio nodes (sources nodes, filter nodes, output nodes, and so on). There is no “buffer-queueing” functionality in the Web Audio API, which would be very useful to render audio synthesized in real time. I found a long discussion of this problem in the Audio discussion list of w3.org. In our case, the important feature of a ScriptProcessorNode is that it produces a continuous sequence of samples with no artifacts of glitches. Since we are generating the samples ourselves, we don’t really need any input buffer but we can rely on the fact that the system will call onaudioprocess() to fill an output buffer with audio samples that will be sent to the playback node. But a limitation is that we cannot decide the playback rate of the output buffer; it will always be equal to the sample rate of the WebAudio context. To complicate things further, this frequency is platform-dependent. On Windows with Firefox, Chrome and Edge, it is usually 44.1 Khz, but I found out that it was instead 48KHz with any browser on my Surface Pro 3. The problem is that the emulator also synthesizes audio at a fixed rate, 48 KHz, and when these two sample rates don’t match we need to resample our audio. And even with resampling there can still be the possibility of glitches because the ScriptProcessorNode works in the (main) thread and can easily cause performance issues. Initializing a ScriptProcessorNode takes as argument the size of the buffer that will be processed by the handler function, and which must be a power of 2 (between 256 and 16K samples). This buffer size then also determines how frequently the onaudioprocess event needs to be fired and even here there is a buffer vs latency trade-off. With smaller sizes we also have smaller latency, but the handler will be called more frequently and it will be easier to have glitching audio. For example having a 1024 samples buffer at 44.1 KHz means that onaudioprocess will be called every 1024/44.1 = 23.2 msec. So, this is evidently not a perfect solution, and in fact the ScriptProcessorNode interface has now been deprecated, to be replaced by Audio Workers, which implement audio processing in the context of a web worker and not in the main application thread. But as far as I know, no browser supports Audio Workers yet, so ScriptProcessorNodes still are the best option. After running the emulator we insert the generated audio samples into the circular buffer. For brevity, I omitted the code that takes care of resampling the audio when the Audio context frequency does not match the 48KHz of our emulator. // can be different from BUFFER_SIZE. 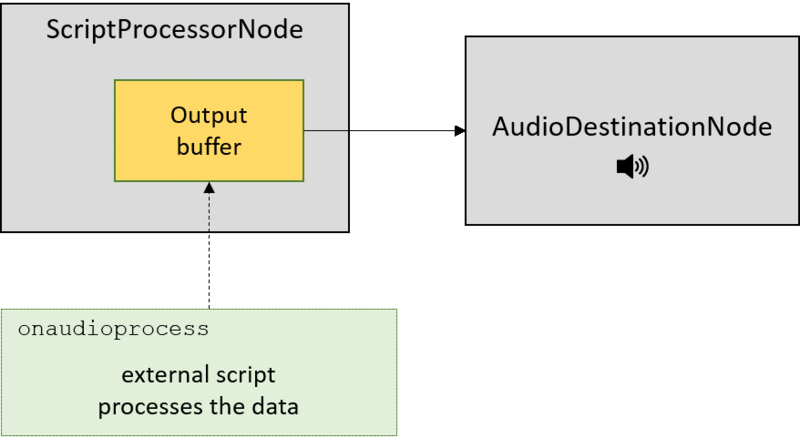 Finally, there is the onaudioprocess event handler, which is called periodically by the ScriptProcessorNode. Here we extract the samples from the queue and feed them to the output buffer. // This function is called periodically by the audio system and runs in the main thread. And that’s really all! We can now play our synthesized sounds also on a browser. 🙂 I must say that the quality of the resulting audio is not always perfect, because of the limitations of ScriptProcessorNode, and there can be sporadic glitches here and there, on slow machines. It will be interesting to rewrite the buffering algorithm with Audio Workers, when they will become available. Looking back at the emulator interface, we saw that we have a single method Run(double ms) that executes the emulator for a specified interval, producing a video frame and a number of audio samples. This is the only really CPU-intensive part of our system. Once we generate a display frame, we can blit it onto the screen very quickly; the Canvas 2D API is fast. Dealing with audio samples means moving around very small arrays of bytes (for a single channel at 48 KHz, 20 milliseconds of audio only take 960 bytes) and the Web Audio API is also fast. So, the only bottleneck is in the engine itself, and everything works very well as long as a call to Run() takes much less than N milliseconds to emulate N milliseconds. Today Asm.js seems only useful for a particular kind of applications, like games, emulators and in general for computational workloads. So, it seems to occupy the same niche which is also occupied by NaCl/PNaCl, the sandbox for native code in a browser developed by Google (which has not had huge success and it is still only supported by Chrome). Very likely, Asm.js will never be used for “standard” web applications, but I wonder whether it could become in the future the “native” language for a new type of web applications based on HTML5. The browser could become the host for a new kind of portable OS, with the canvas and WebGL APIs used for the user interface, the WebAudio API for the audio, WebRTC for real time media streaming, WebSockets and XMLHttpRequests for networking, local File API and cloud APIs for storage, and so on. 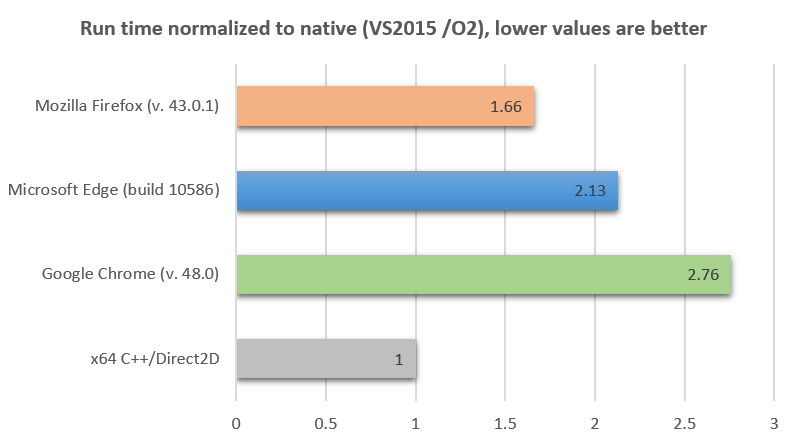 And very soon also C# and the other .NET languages could be viable alternatives to C++ to compile into Asm.js. Microsoft in now working on LLILC, an LLVM-based MSIL compiler. For now the goal of the project (open source) is to create a .NET JIT for LLVM, but the plan is to have also an AOT compiler in the future. This concludes my little exploration of the world of retro-gaming and the emulation of vintage arcade games. 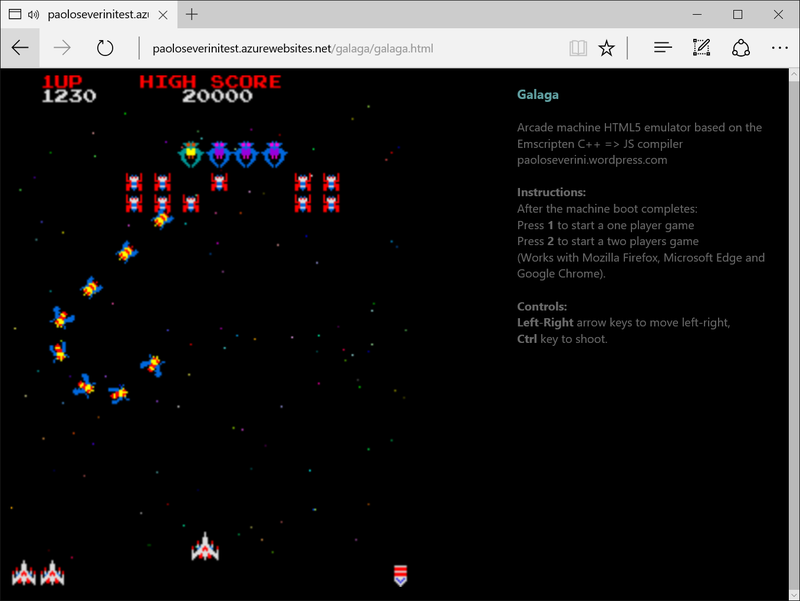 If you are interested, you can play with my version of Galaga online HERE.